Hiking to highest peak of Volcano Semeru could be done via several routes, general climbing routes is Route Ranu Pani ,a most popular climbing route for Mahameru, summit of volcano Semeru.The route is also most intensively in used by both domestic or international trekkers/hikers/climbers,used to be functioned as climbing basecamp by most climbers.This route is also most recommended ones.While the most popular touristic volcano of East Java : Bromo possessing it's basecamp at Cemoro Lawang, a closest caldera rim down to volcano Bromo crossing the sandsea of Tengger Caldera. Cemoro Lawang is touristic area, most accommodation from hotel to basic guesthouse are available here as well transport, mostly Jeep.View Volcano Semeru in the distance is well visible from view point Pananjakan area, a mountain that's still in one complex of Bromo Tengger Semeru. Closest access to Climbing Basecamp Ranu Pani are Tumpang and Cemoro Lawang.Tumpang it self is accessible via from Malang or Surabaya, while Cemoro Lawang is also accessible either from Malang or Surabaya, but most international travelers accessed them from Surabya,East Java. While Bromo area is accessible 3-4 hours drive from Surabaya, also accessible from Malang, even from Ranu Pani,the last village on the foot of Volcano Semeru.To access Bromo area from this last village, rent a car jeep is needed to drive cross "Sand Sea of Tengger" head for Bromo area locally popular as Cemoro Lawang. The hike to Bromo crater's rim from Cemoro Lawang takes approx two hours or one and half hours on horseback.While reach volcano Pananjakan from Cemoro Lawan can be done by car jeep in early morning to catch best panoramic views of Bromo-Tengger-Semeru from top of volcano Pananjakan. Common local trip is commenced at Cemoro Lawang head for Pananjakan, then down to sandsea for visiting Bromo, and return to Cemoro Lawang. Volcano Semeru and Bromo are under management of national park format. Report,registration,permit and entrance ticket are required to do hiking climbing here.When alert level over normal active, and or extreme weather condition, hiking activity is normally only allowed till certain distance, even may not allowed due to other reason such to recover ecosystem, accident and there's rescue operation at the time.More detail about this, contact relevant resource. Ranu pani is the trailhead of hiking, also name of lake located on foot of volcano Semeru and name of village usually used as trekking / hiking base both domestic or international climbers trekkers.This base accessible approx two hours by car Jeep from Tumpang, while Tumpang itself is accessible 30 minutes by bus from Malang with distance 18 km.En route Tumpang-Ranupane you experience views of caldera environment in the distance...also "Sand Sea" which is locally called Segara Wedi.At Ranu Pane, available: Information center, trekking basecamp, as well as guesthouse. Ascent to summit of volcano Semeru is commenced from trekking basecamp at Ranu Pani head for Watu Rejeng distance 5 km pass through relatively flat trekking path.Then continue heading for Lake Ranu Kumbolo distance 4,5 km.At Ranu Kumbolo, there was already available camp site plus shelter which are normally used by domestic trekkers / hikers for overnight. Next...to reach the summit of volcano Semeru, then proceed the trek heads for Kali Mati distance 4,9 km pass through steeper path locally called "Tanjangan Cinta. Kali Mati is name of dry river or river without water, while "Tanjangan Cinta" is name of trail / route part covers 200 m in length. This trail part is steeper and hikers normally strive to tackle this trail part without taking any break.Tanjangan mean steep forward trail, while cinta mean love.Upon finishing "Tanjankan Cinta", then enter to savana zone locally called Oro-Oro Ombo.Next...forest zone locally called Cemoro Kandang.Savana zone is ideal point for taking break for your refreshment since it relatively flat, and more important...you can take in views of Mahameru, peak of volcano Semeru from this point. From Kalimati you need only to hike 1 km heading for Arcopodo.Arcopodo itself come from local words: arco and podo, arco mean statue, while podo mean same.So...Arcpodo mean the same statue. According to local resource, In the past time there were found two twin statues on this site, and there fore this site called as Arcpodo.To reach peak of volcano Semeru from Arcopodo, it's need to continue hiking head for Cemoro Tunggal.Cemoro Tunggal is a border between vegetation forest and steep sandy route part.Cemoro mean Cemara, a kind of tree, while tunggal mean single. From this point, it's need only approx two hour hiking to reach summit of volcano Semeru through sandy steeper route part, the crux ones. Distance from Arcopodo head for summit of Semeru is about 1,5 km. 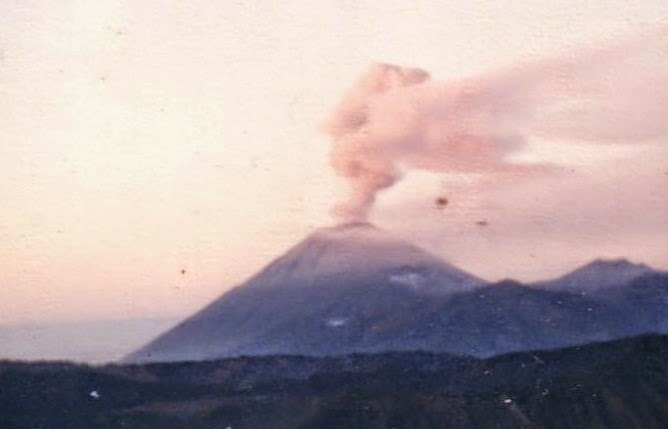 To do summit push from Arcopodo or Kalimati, it is better to be done in early morning to get more possible better weather, and witness the volcanic explosion of Crater Jonggring Seloka every 15 - 30 minutes, more important...you get safer from risk of positioned gas of crater Jonggring Seloka.There is no need to stay long on summit zone, just few minutes then descent in the morning as photo capts or sight seeing already done, before fogy / cloudy. Rest day prior to hike commencement could be done at closest district. Guest house / homestay available at Tumpang, also available at closest village Ranu Pani. Local guides and porters for hiking Semeru are also available at Ranu Pani.Cemoro Lawang is more touristic area, located on caldera rim of Tengger, overlooking sea sand below and surrounding volcanoes such Bromo. Hotel, guest house,local guide,Jeep and restaurant are widely available here. Visit Bromo surrounding can be done whole years, but best time normally on April - November when you have a better chance of catching a blood red sunrise over volcanoes surrounding. However...this area is overrun by conventional mass tourists three times a year, normally on February when an annual festival ceremony takes place, over Christmas, and during July - August.If you don't like crowds, so...plan your visit for another time. Alert level of Bromo normally effects safety distance. Volcano Semeru attracts many hikers / trekkers both domestic or international trekkers particularly International lovers volcano, high hiking season normally on July-August,too crowded on peak season 15-18 august by domestic hikers wishing to celebrates Indonesia Independent day on Mahameru, the summit of volcano Semeru.Visit volcano Semeru for hiking up it's summit could be done on dry season, normally June-Sept. Remember...weather could change from it's normal pattern anytime. Other important aspect should be paid attention before visiting this volcano is the Early Alert Level.Check out allowed safety distance for your safety before you go.While on rainy season...SCONDARY VOLCANIC HAZARD in form of Lava Flood normally could happen due to high intensity of rain, and objective danger normally appear in form of bad weather. Deadline of staying on Mahameru peak zone is generally till 10:00 am (check out to officer for more updated condition). Descent in the morning before that deadline will be safer since by that time wind began to blow to north side. So...descending before wind blows to the north and sweeps gas head for trekking / hiking trail is very important aspect of trekking at Semeru for safer. Gathering updated relevant info of last condition of volcano alert,seismic trend and weather is important prio to departure. In case of emergency at climbing route that could not be handled by self rescue, contact closest relevant authority office such National Park Bromo Tengger Semeru.Relevant team Sar is normally standby at basecamp.Closest medical center locally called "Puskesmas" is available at Tumpang. Health-check up possible to be done at medical center.Normal available transport and standard one is Jeep specially for accessing Tumpang - Ranupane. Photo Contributors By: Olenk Ambo Upe,Peo & Indah "samagram"